Added 2/6/2008 Here's Quake, missing an arm, in his pre-cowboy-hat-with-a-cape look. Back when he wore a miner's helmet, which made sense for a guy who made earthquakes. Also not on the recent bad quality Cap'n Crunch and Friends DVD or the good quality Thunderbean commercials DVD. 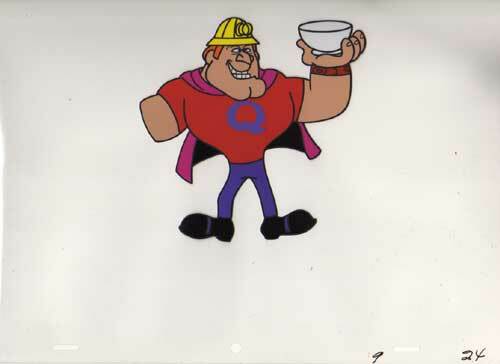 I don't know why there's so much Jay Ward commercial cels around right now; I wonder if someone died. They've been showing up from multiple people tho, and many are not regular cel dealers.